PRODUCT DETAILS: Wilbur Curtis G3 Airpot Brewer 2.2L To 2.5L Single/Standard Airpot Coffee Brewer – Commercial Airpot Coffee Brewer – D500GT12A000 (Each). Precise Gourmet Control Over All Critical Functions — The G3 Digital Control Module provides you the expertise to brew premium gourmet coffee with ease. Portable design makes this airpot coffee brewer easy to transport. Built-In Fine Tuning Brewing Modes — Pre-infusion or pulse brew enhances extraction of gourmet coffee flavor. Cold water brew lock-out prevents brewing when water temperature is below set level. The Digital Control Module is encapsulated in high-tech polymer and is impervious to heat, steam and moisture. NOTES: Professional Installation Required; Dedicated Water Line And Power Supply (Not Included) Within 4′-6′ Of Brewer. 120V Cord And Plug. Precise Gourmet Control Over All Critical Functions -The G3 Digital Control Module provides you the expertise to brew premium gourmet coffee with ease. Built-In Fine Tuning Brewing Modes -Pre-infusion or pulse brew enhances extraction of gourmet coffee flavor. Cold water brew lock-out prevents brewing when water temperature is below set level. 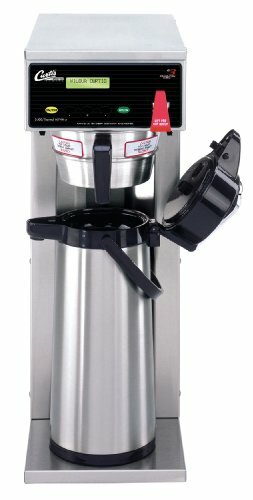 This commercial airpot coffee brewer is an integral part of any restaurant, hotel and food service location. The Digital Control Module is encapsulated in high-tech polymer and is impervious to heat, steam and moisture. This airpot coffee brewer has advanced features designed to be the leading commercial coffee brewer and restaurant coffee brewer. Intuitive Scroll-Through Precision Programming -Large, brightly lighted display communicates functions at a glance. Easily adjust time, volume, temperature, brew functions and more. User-friendly features were designed for food service professionals that need a reliable airpot coffee brewer. Wilbur Curtis is the preferred beverage equipment provider of restaurants, hotels and other commercial food service establishments. Its products are designed to meet the durability and performance needs of food service professionals. Popular choice because this commercial airpot coffee brewer keeps coffee hot and fresh. (DISPENSER NOT INCLUDED).